We all know what law school stress looks like. Come exam time, we see its physical manifestations: the law student, hibernating in the law library, subsisting on a diet of coffee and candy, sits surrounded by mountains of books, empty cans of energy drinks and an arsenal of highlighters. We recognize the bloodshot eyes and the anxiety-ridden knuckle cracking. 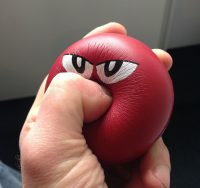 Stress is synonymous with law school, but it’s important to remember that stress is merely the interaction between a situation and the way we perceive it. You cannot eliminate all the stress from your life, but you can modify your reaction to it. Situation: You landed an interview with the firm of your dreams. You visualize yourself summering and articling there and launching your legal career into the stratosphere. Sadly, during the interview, you were asked an unexpected question. You froze, yourthoughts racing and heart pounding. after what seemed like an eternity, you stuttered something incoherent. You know that you blew it. Solution: Reframe your thinking about this interview. Yes, maybe you did not get the job. However, instead of focusing on your disappointment and perceived weaknesses, which will only lower your self-esteem, concentrate on viewing this as a learningexperience. Identify the reason why you struggled with the question, call the interviewer to ask for some feedback and work on improving your interviewing skills. (and check out our list of common interview quest ions in this article: practicepro.ca/20newlawyertips) Next time, you will be better prepared to handle tough questions and you will be one step closer to getting that offer. Solution: Feelings of inadequacy are not uncommon when law students discuss the following: how much time and effort they devoted to an essay or exam, how deep their understanding of the course material is, the difficulty level of an exam, etc. Steer clear of these stressor conversations. Set boundaries with your friends. If your friends insist on discussing the exam, remove yourself from the conversation. Remember that conversations of this sort are never productive, you have already finished your exam and you cannot edit your answers. additionally, just because your friends answered the questions differently does notmean that they were right. Law professors mark exams in mysterious ways. Before panicking, wait until you get the exam results. If you did underperform, focus your efforts on the next exam. Situation: This is a hectic week and you are sure that you are on the verge of a nervous breakdown. You have a 20 page essay due, your moot factum is still unfinished, you are behind on all your readings and you are doing intake interviews at the legal aid clinic. How are you going to get through this? Solution: For now, you have no choice but to take a deep breath, break each project into smaller tasks, stop procrastinating and get to work. Take everything one small step at a time. In the future, try to spend more time with your non-law friends. They will help you maintain your mental health. Your law school friends are dealing with the same stressors you are, and commiserating over these challenges may exacerbate your anxiety. If you spend all your time with law students, you will eventually start believing that your entire self-worth depends on how many OCI interviews you got or how many course prizes you won. Non-law friends can take you out of your funk. They can show you a different perspective and remind you that there is a world outside of law. Find people who will look perplexed when you make a Lord Denning joke and make sure you spend some time with these people each week. Finally, although most law school-related stress is manageable, if the stress in your life becomes overwhelming, be sure to seek help. 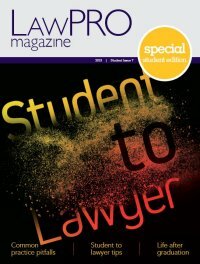 Law students often don’t realize that they are eligible to access the services provided by the Member assistance Program (MaP) for lawyers – a program funded by the Law Society of Upper Canada and LawPRO, and delivered by Homewood Health. Visit lsuc.on.ca/map for more about the MAP. Alexandra Kozlov graduated from the Queen’s Faculty of Law in 2012 and articled with the Workplace Safety and Insurance Appeal Tribunal.